The Energy Hawks pose in front of an oil well. EERC staff loaned them work clothes for the trip. Photo courtesy of EERC. 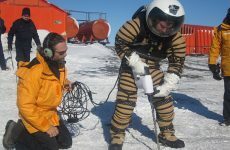 If you want to learn about energy, go to the source. Ten “Energy Hawks” did just that. 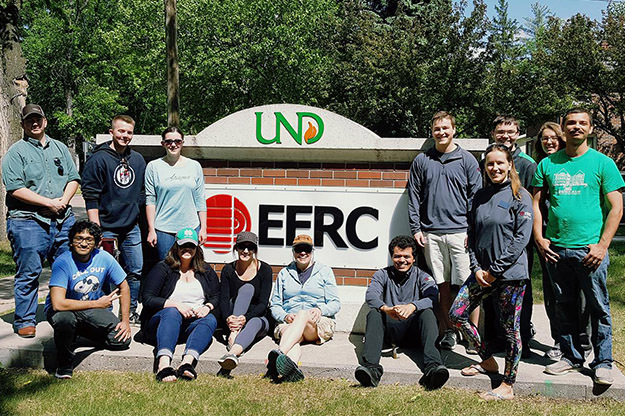 The UND students – part of a new Grand Challenges research program – spent a week traveling throughout western and central North Dakota to learn about energy challenges and opportunities. From oil rigs to power plants, infrastructure to law enforcement, the students in the Energy Hawks program saw aspects of energy production that most people never experience. Energy Hawks were impressed by the size of wind turbine blades. Photo courtesy of EERC. The Energy Hawks program is spearheaded by Tom Erickson, CEO of the UND Energy & Environmental Research Center and Champion of the One UND Strategic Plan Grand Challenge in energy security and environmental sustainability. The 10 students, who have a variety of majors, are working over the summer at the EERC. The students traveled to Watford City on a Sunday afternoon, then met Monday morning with local officials and learned about the growth of the city – which grew from 1,700 people to 6,000 in just seven years – and impacts on law enforcement, social services and schools. They also met with State Senate Majority Leader Rich Wardner and toured the north unit of Theodore Roosevelt National Park. Tuesday featured Neset Consulting Service in Tioga, where students learned about oil and gas production, horizontal drilling, and visited Liberty Gas Plant, which collects natural gas from wells. The highlight was a drilling rig. Wednesday’s tours included the Great Plains Synfuels Plant and Antelope Valley Station power plant in Beulah, where they learned about using coal to make natural gas, fertilizers, chemical feedstocks and electricity. At the Freedom Coal Mine, the largest lignite mine in the U.S., students were especially impressed by the reclamation process and the size of the draglines. They ended the day with a trip to Garrison Dam, which generates hydroelectric power. 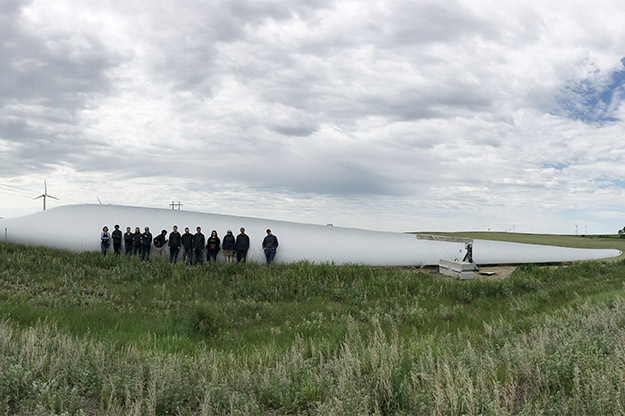 Thursday featured Verendrye Electric Cooperative in Velva, along with one of their solar sites, and Prairie Winds wind farm by Max, where the Energy Hawks were wowed by the size of the turbine blades. In Bismarck, they met with state officials from the Department of Mineral Resources, the North Dakota Pipeline Authority, and Public Service Commission. On Friday, they toured the Dakota Spirit Ethanol Bioprocessing Facility in Spiritwood, which converts corn into ethanol and produces high protein cattle feed and corn oil. The final stop was Spiritwood Station, a combined heat and power plant, which supplies steam and power to Dakota Spirit. 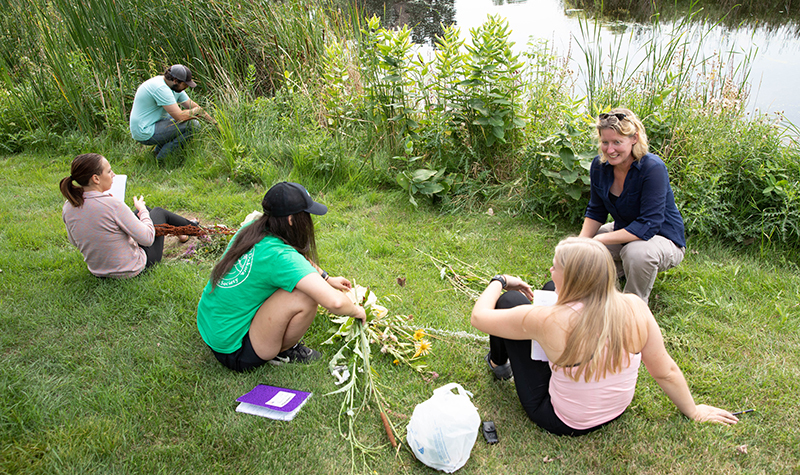 Energy Hawks spent their summer researching energy at the UND Energy & Environmental Research Center. Photo courtesy of EERC. After a week of 12-hour days and more than 24 hours of driving, the Energy Hawks were, well, energized. 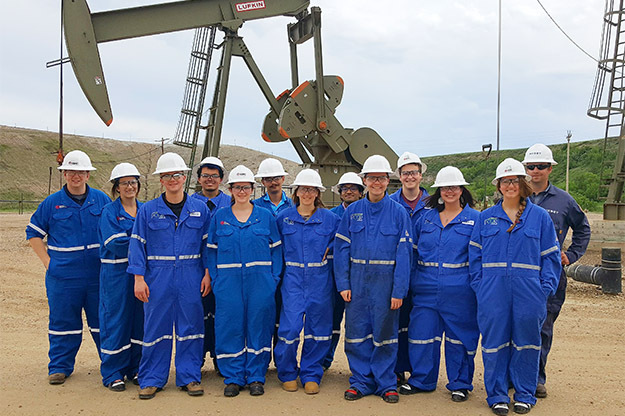 The overall Energy Hawks program and tour was organized and led by Charlene Crocker, EERC research scientist, with logistics by Angie Morgan, EERC administrative assistant.